Berwick-Upon-Tweed, more commonly known simply as Berwick (pronounced Berrick) is an Ancient Walled Town at the far Northern reach of the Northumberland Coast. Throughout history this has been an area of intense conflict and the evidence of this remains today is clear, with it's huge fortified Town Walls. 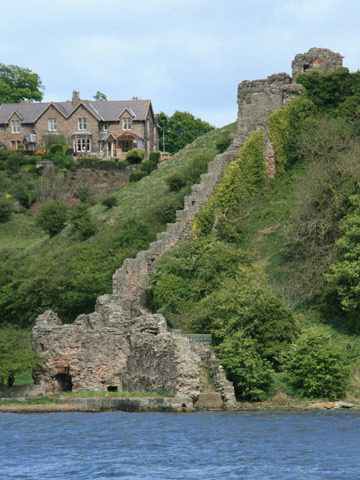 In Elizabethan times the Town had huge defensive walls built to deter the potential invasion of the Scots. Berwick changed hands between the English and the Scots an amazing 13 times before finally being re-captured in 1482 by the English, in who's hands it has remained ever since. Three bridges connect Berwick with Tweedmouth on the South side of the river, the most impressive of which being the railway's 'Royal Border' bridge designed by Robert Stephenson and completed in 1850. Today Berwick is a beautiful Market Town that is immensely popular with visitors. It has many architectural features of note, an incredibly turbulent history to explore, a thriving arts scene and excellent facilities and amenities. Click Here for our interactive Berwick Town Centre Map showing all the attractions and town amenities, as well as parking, travel information and recommended viewing points. 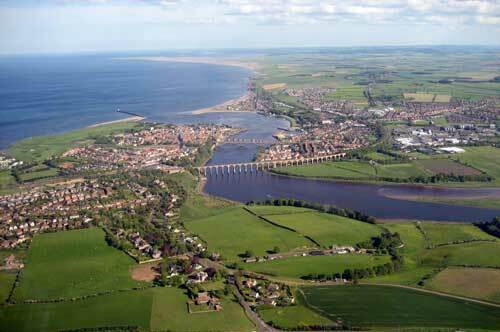 Berwick is easily accessible by car, being just a mile or so from the A1. The Town's main car parking areas are Castlegate Car Park (550 spaces), Coxons Lane, at the junction of Church Street and Walkergate and by the quayside. There is also a car park right on the coast at the end of Pier Road. All these car parks are marked on our interactive Berwick Town Centre Map. Berwick has a Train Station on the edge of the Town Centre that is part of the East Coast Mainline from London to Edinburgh and as such is very well served. It is a popular way to visit Berwick, the train line itself runs right along the coast from Alnmouth and is one of the most beautiful train journeys you will ever experience! Berwick is a stop on the Arriva "Newcastle - Morpeth - Amble - Alnwick - The Coast - Berwick" which is the service between Newcastle and Berwick on their X18 route (see link below for more information). Multi journey tickets are available and you can get more information here. There is a packed calendar of events in Berwick to enjoy, the most famous of all is the unique and historic 'Riding of the Bounds' In 1604 King James granted Royal Charter to the Burgess of two thirds of land that lay within the Bounds of Berwick which was marked by boundary ditches and stones. Then in 1609 the Burgess rode the bounds for first time and since the threat from the Scots ended with the Union of the Crowns the event has become a civic occasion. Starting in Barrack Square the riders set off after gaining permission from the Mayor to make sure the 'bounds' are secure, before reporting back. Up to 150 riders take part in this fantastic event that takes place on the first Saturday of the Early May Bank Holiday each year and it can be quite a spectacle More information about the event ca be found on the Berwick Bounds website. Berwick Food Festival takes place annually in September. Each year there is over 40 stalls with exciting local produce, cooks can learn from professionals, the beer festival and activities for the children. The Festival also likes to try and teach about food heritage, where your food comes from and it's providence. The Tweedmouth Feast takes place on Tweedmouth Village Green by the river and has been running for over 1,100 years! Berwick Film and Media Arts Festival takes place mainly at the Maltings Theatre and Arts Centre in to Town but other venues include The Gymnasium Gallery at Berwick Barracks, The Barrels Ale House, The Church of Holy Trinity and St Mary, The Guildhall and the Prison Cells in the Town Hall. It is a well established and attended event that takes place each September. Remember to check out our Events Page for a full listing of events in the Berwick area and around the County. Berwick's main shopping street is Marygate that runs almost right through the Town. There are main big chain shops here including WH Smiths, Superdrug, Boots, Topshop, Phones4U, Thomas Cooks, Thomsons, Sports Direct, Grainger Games, H Samuel, Clarkes Shoes, Cancer Research UK. There are also a number of independent shops and Deli's to explore. Until recent years Berwick was not well served by the larger supermarket chains, but all this has changed with the recent arrival of Tesco and Asda. There is also a Morrisons on Loaning Meadows, Near the A1 and a Co-op in the Town Centre. Don't forget there are independent Deli's and Grocers in the Town Centre, so you don't have to use the big supermarkets.